Fermanagh set up an All-Ireland Football quarter-final against Dublin on 2 August by beating Westmeath 1-13 to 0-07 at Breffni Park. Tomás Corrigan scored a goal and seven points as Pete McGrath's men saw off a misfiring Westmeath. Fermanagh had trailed early in the game and lost half-backs Marty O'Brien and Ryan McCluskey to black cards. The Erne county dominated the second half to set up their last-eight game against the All-Ireland favourites. It will be Fermanagh's first appearance in the quarter-finals for 11 years. "Obviously we are going to have a huge task in our next game but these players do not know when to quit," said Fermanagh manager McGrath. "They are playing exceptionally well, have great heart and character, and if they can take that to Croke Park next week who knows what will happen." Changing their free-taker certainly paid handsome dividends for the Ulster county, and McGrath revealed it was a tactic they had talked about in the build-up to the game. "Against Roscommon, Sean Quigley's free-taking was not as unerring as it normally is and Tomás took over," said McGrath. "We agreed during the week that if Sean was not hitting them the way he normally does, we would make the change again. "Tomás hit some fantastic frees - none of them were easy." 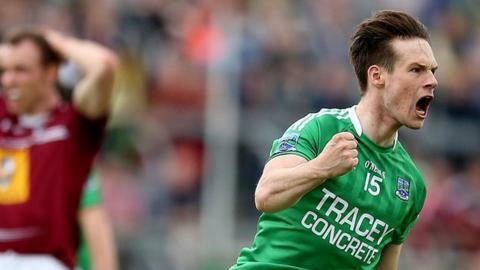 Corrigan hit three from play as Fermanagh came from 0-5 to 0-2 down to be level at the interval, John Connellan landing four of Westmeath's scores. Corrigan sent over a 40-yard free out of his hands to edge Fermanagh into the lead for the first time and Denis Glennon replied straight from the kick-out. But that response was to be Westmeath's last score for well over 20 minutes as Fermanagh rattled off five points and a goal to take total command. Corrigan ran on to a flick-on and coolly lobbed a sublime finish over replacement keeper Gary Connaughton for the goal which put Fermanagh into an unassailable 1-12 to 0-6 lead. With just a few minutes left, it was game over. Fermanagh scorers: T Corrigan 1-7, S Quigley, D McCusker 0-2 each, N Cassidy, D Kelly 0-1 each. Westmeath scorers: J Connellan 0-4, S Dempsey, D Glennon, R Connellan 0-1 each.